Garima Pant in love with a NRN? The 2-years long affair of actress Garima Pant has recently been unveiled. According to rumors, Garima is seeing a Belgium resident, Hari Sharma Thapaliya for the last two years and they are very serious on the relationship. There is a possibility that the two are planning to get married soon. Garima and Hari Sharma met when Garima went to Belgium for various cultural shows in Europe during the August of 2013. Actresses Nandita KC and singer Rima Gurung Hoda were also with Garima in that tour. Hari is running a restaurant business in Belgium. He was married to a Chinese woman until he met Garima. After meeting Garima, Hari reportedly has divorced the Chinese woman. As the relationship become close, Hari has frequently visited Nepal to meet Garima. Box Office Film Club has honored 10 movies in an event held in Nagarkot at the end of the year 2071. Like previous years, the Club has selected the most successful movies in the year. Out of the movies released on the last Friday of 2070 to the last end of 2071 top ten movies were awarded with different honors. The movie ‘Kohinoor’ was awarded the Super Duper Bumper Block Buster movie of the year 2071. The movie ‘Nai Nabhannu La 2’ (watch ‘Nai Nabhannu La 2’ here) was awarded Super Duper Hit honor. ‘Kabaddi’ (watch ‘Kabaddi’ here) and ‘Jerryy’ (watch ‘Jerryy’ here) were awarded Hit movie honors. The organizer of Fanta The Hidden Treasure Miss Nepal 2015 Beauty Pageant, Hidden Treasure Pvt. Ltd. has re-scheduled the Grand Finale from Friday April 17 to Saturday April 18, 2015. The re-scheduling of the contest is done because of the national mourning declared by the Nepal Government on Friday April 17, 2015. The government has declared national mourning on the death of 5-times prime minister of Nepal, Surya Bahadur Thapa. A video report of the death of ex-prime minister Surya Bahadur Thapa. 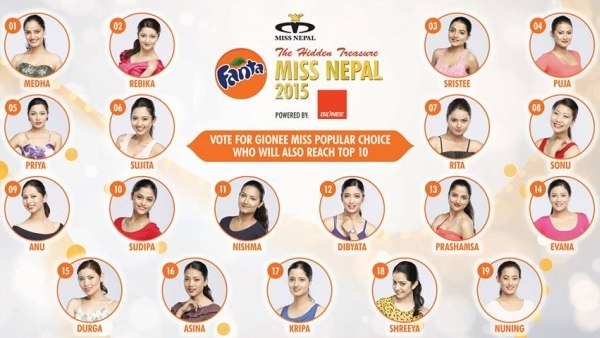 The Miss Nepal Pageant 2015 Grand Finale will be held on Saturday April 18, 2015 at 7:15 pm at Hotel Annapurna (Durbar Marg). The invitations and tickets for the April 17 event will also be valid for April 18th, 2015 event. To participate in the premier show of ‘Chankhe Shankhe Pankhe’ on April 17, the film production team has arrived in Bahrain on April 16. The team comprising of the actress Pooja Sharma, producer Santosh Sen, and the director Sudarshan Thapa. The movie told to be the most costly movie to make in 2071 BS, will be released in Nepal on May 15. The Censor Board has awarded PG certificate to the movie. Almost a week after the release of the movie, a press show of ‘Hawaldar Suntali’ was held on April 16 in Gopi Krishna Movies. The press show of the movie released on April 10 was held among journalist and film personalities. In response to the rumor of the distance between the actress Shilpa Pokharel and the producer Chhabi Raj Ojha after Shilpa did Karishma Manandhar‘s movie ‘Falgu’, Chhabi embraced the actress and told that they are as close as ever. Both Shilpa and Chhabi looked happy in each other’s company and the success of the movie in theater.